qualifications, selection procedure and other details are given below. 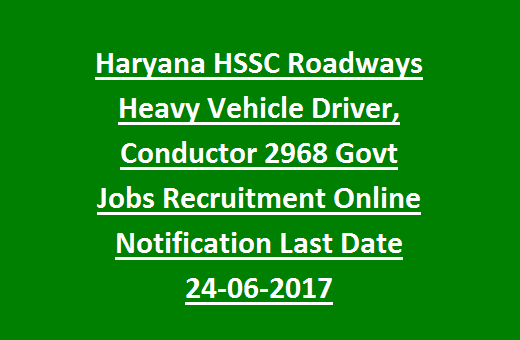 See the official notification of HSSC Haryana Roadways Driver, Conductor Recruitment. Online applications starting date: 25- 05- 2017. Last date to submit online applications: 24- 06- 2017. Last date to deposit application fee: 28- 06- 2017. 1. Heavy Vehicle Driver: 2038 posts. must have passed Matriculation or its equivalent qualification. up to matric level or higher level education. Candidate must hold Conductor license. vacancies will be based on their performance in driving test/ Interview/ Viva. application form through online only.